Black buying power continues to increase. It is currently $1 trillion but is forecast to increase up to $1.3 trillion by 2017. Population growth and increased educational attainment are key factors in the uptick in Black consumer power according to the “Resilient, Receptive and Relevant African-American Consumer 2013 Report” by Nielsen and the National Newspaper Publishers Association. (FinalCall.com) - Black people pooling economic resources is not an unrealistic fantasy or “wishful thinking” naysayers often suggest. In fact, nationwide, efforts large and small are underway to put into motion the means and methods of making economic development and economic growth in Black communities not just a slogan but a functioning reality. The time is now to establish institutions that can create jobs and promote community development, said advocates. 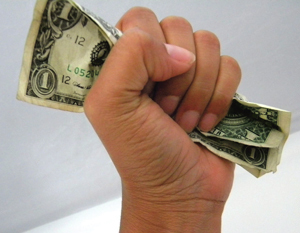 With a buying power of over $1 trillion Blacks could harness those dollars to Black owned initiatives and opportunities for real socio- economic change would be limitless, said Black business advocates, entrepreneurs and activists. “We should begin to spend a substantial portion of those dollars with Black-owned businesses; we should be depositing substantial amounts of those dollars in Black-owned banks,” said Lasana K. Mack, founder and executive director of APPEAL, Inc., based in Washington, D.C.
By doing this, explained Mr. Mack, those very same Black financial institutions will then have the capacity to fund projects, goods and services needed by Black consumers. Established in 2012, APPEAL stands for the Association of People for Pan-Africanist Economic Advancement thru Leverage, a non-profit organization dedicated to educating Black communities on financial, cultural and historical literacy. Mr. Mack, former city treasurer for Washington, D.C., said among APPEAL’s several goals is opening a full-service bank and investing in projects and ventures domestically and abroad, particularly in Africa. “African-Americans have continued to grow their financial power as the number of African-American households has increased by 20 percent since 2000, while aggregate income has increased 45 percent, meaning that Blacks’ income has grown 2.3 times faster than the number of Black households,” said the report, released in September. The Black population is now at 43 million, and Blacks account for 13.8 percent of the U.S. population. This number includes those who are Black and Black combined with another race. Organizations, groups, businesses and individuals are pushing Black financial and entrepreneurial cooperation that is vital to turning around disproportionate negative conditions in Black communities. High unemployment, foreclosures, sub-par education, disenfranchised youth and an ever-widening wealth gap are ongoing battles. It is feasible for Blacks to come together and do more financially for the betterment of their communities, “although it is a challenge to get many of our people to see that,” Mr. Mack conceded. There is not an overabundance of Blacks in finance that are oriented toward a Black or Pan-Africanist economic empowerment and wealth building approach, he continued. APPEAL’s credit union initiative seeks to help address this. The financial initiative is initially rolling out online, with the goal of having physical “brick and mortar” locations, said Mr. Mack. In Chicago, efforts at operational unity are also happening. Toure Muhammad, owner and operator of Bean Soup Times, sponsors regular business networking socials and gatherings at Black-owned establishments throughout the Windy City. It provides an opportunity for Black businesses owners to meet one another, exchange ideas and partnering. A Sept. 28 gathering was themed, “The Blueprint: Uniting for Business Prosperity” and was held at the Nation of Islam’s Salaam restaurant, on the city’s South Side. The Congressional Black Caucus Foundation recently announced it would deposit $5 million in Black-owned financial institutions. Five banks received $1 million each including, the Industrial Bank in Washington, DC; Liberty Bank & Trust Company in New Orleans, Mechanics & Farmers Bank in Durham, N.C., Seaway Bank & Trust Company in Chicago and City National Bank of New Jersey in Newark, New Jersey. Businessman and author George Fraser, chairman and CEO of FraserNet Inc., holds yearly power networking conferences drawing thousands of Black businessmen and women for a weekend of training and networking as does Black Enterprise, which holds yearly conferences to bolster and educate Black entrepreneurs. Radio personality Warren Ballentine frequently uses his platform to educate and inform listeners on economic development and business opportunities. Dr. Claud Anderson, author of such notable books as “PowerNomics: The National Plan to Empower Black America” and “Black Labor, White Wealth: The Search for Power and Economic Justice,” is also still sharing his expertise on helping Blacks become more financially and economically astute. Dr. Michele Hoskins is founder and CEO of Michele Foods. Michele Foods manufactures a line of breakfast syrups based on her grandmother’s recipe handed down from her grandmother. As a mother of three, who was once on public assistance, Dr. Hoskins decided to start her own company in 1984. Her products are now in over 8,000 stores nationwide. Developing her entrepreneurial spirit led Dr. Hoskins to want to help other entrepreneurs. “I just really believe in entrepreneurship and having your own and leaving a legacy, being independent and all those things. Through my course of doing that, I’ve mentored about 150 people,” said Dr. Hoskins. She does this in part through her From Recipe to Retail sessions for those wanting to get into the food industry. Effective marketing, pricing, distribution and cost are a few of the subjects she covers. Dr. Hoskins along with businessman Ken Brown a former McDonald’s franchise owner, kicked off the No Excuses, Only Results tour, aimed at new, struggling and established entrepreneurs. The 20-city tour begins in Chicago on Oct. 3 with stops in Dallas and Milwaukee on the early schedule. Dr. Dennis Kimbro, lecturer and author of Think and Grow Rich: A Black Choice is the tour’s special guest presenter, said Dr. Hoskins. “What Ken and I want to emphasize is that you have to learn how to start a company, grow a company and manage the company and have a legacy. Even if you build a brand and sell a brand, let that brand continue on,” said Dr. Hoskins. Blacks must learn how to build something, hold on to it and pass it on. The businesswoman hopes the tour will help spread that message. Dr. Hoskins said the biggest issue now is that Blacks do not spend their $1 trillion with each other. Once Black-owned businesses are identified, Blacks must then see the value in spending their money with those businesses. If Black people see the value of Michele Foods products as opposed to the maker of Aunt Jemima which is not a Black-owned company, Ms. Hoskins said it would enable her to hire “multitudes” of Black employees. Mark Allen, chairman of the Chicago branch of National Black Wall Street, U.S.A., said the powerful message of unity is an image Black people need to see reflected in Black leadership, particularly now. Mr. Allen, said the historic 1966 photograph of the Honorable Elijah Muhammad meeting with Dr. Martin Luther King, Jr., holds weight, even today. “So, whether it was Dr. King’s (Operation) Breadbasket campaign or whether it was the Honorable Elijah Muhammad’s Economic Program, despite your religious differences, they both were telling their members and supporters the importance of how to use their economic power to do more for self in the Black community,” said Mr. Allen. Operational unity in the 1960s was the catalyst for building Black businesses and jobs which increased economic and political growth. “That promise is even more so present today than it was yesterday,” he added. This is one reason Mr. Allen supports Minister Louis Farrakhan’s call for a meeting with national Black leaders and started a petition on Change. org in support of that meeting. In Chicago, National Black Wall Street has partnered with the city treasurer’s office in a campaign to help 1,000 children open savings accounts at a local bank. “You have to start investing into the mindset of our children. When you take thousands and thousands of children and show them the example of what it means to start saving and have a banking relationship instead of going into a relationship with the Currency Exchange, that’s going to grow into something significant,” said Mr. Allen. The busy activist said the organization is also spearheading efforts to reestablish a community location where people can come and learn economic and financial principles and how to create and sustain Black businesses in their communities. “We’ve got to go back to that spirit of what Dr. King and the Honorable Elijah Muhammad talked about then. Separating our religious differences and work on a common operational type unity when it comes to the Black economic agenda in the Black community,” he said. 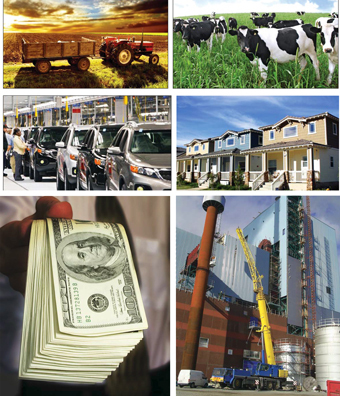 The Nation of Islam patriarch established the highly successful Three Year Economic Plan in the 1960s and 70s and established business entities, purchased farmland, engaged in trade and commerce and opened schools, providing jobs, and a sense of ownership and community not just for Muslims, but the Black community as a whole around the country. Since rebuilding the work of his spiritual father, Min. 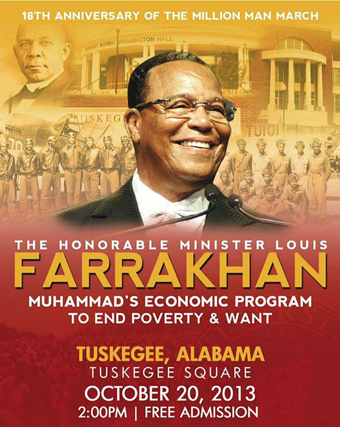 Farrakhan has worked tirelessly and against fierce opposition to reestablish the Economic Blueprint of Mr. Muhammad. The Nation of Islam minister will announce where people can begin depositing as little as 35 cents a week to help purchase farmland as a start to economic development and opportunities for Blacks. During a recent broadcast of his online lecture series, The Time and What Must Be Done, Min. Farrakhan reiterated the need for Blacks to stop being beggars and become builders. “Let us get up from the foot of our 400-year-old enemy and stop being beggars and start thinking of ourselves as builders! And join me in celebrating the 18th anniversary of the Million Man March in Tuskegee, Ala., on October 19 and 20! Put those nickels and dimes away and remember on that day, we will announce the bank and the banking institutions and how we will go about it!” said Minister Farrakhan. For more information about the 18th anniversary of the Million Man March and Holy Day of Atonement 2013 visit http://www.noi.org/hdoa2013.